Matthew Myers (St Andrews) secured his first Students' Tour win of the season after a 3 under par 69 gave him victory by six shots in the men’s event of the Autumn Trophy over Blairgowrie Golf Club's Lansdowne course today (Tuesday). Jen Saxton (Stirling) took the honours in the women’s event, her overnight lead of nine shots proving too much for the opposition to make up on the final day. With a very tight leaderboard at the start of the day, the final 4 men’s groups knew that it would take a low round to come out victorious. Luckily, while the wind was still strong the conditions on day three were far more conducive to making that happen. Myers made the most of this, a two under par front nine giving him a two shot lead at the turn that he didn’t relinquish. Indeed, he was only of only two players to come back under par (honourable mention to perennial tour challenger James Glenn (Durham) who was predictably strong over the final round with a one under 71), a one under 35 giving him a total of 69 and a one under total for the tournament. Graeme Greer (SRUC) shot a solid level par back nine to sign for a 73 and give him second place on countback from Bojesen. In the men's team event, Bojesen and Myers’ efforts ensured that St Andrews I comfortably held off the challenge of Stirling II to take home the title, with support from Peter Kerr and George Burns, celebrating the latter’s 21st birthday in style. With Saxton’s performance in round 2 it appeared at the start of play that the challenge was going to be who could finish second and third. 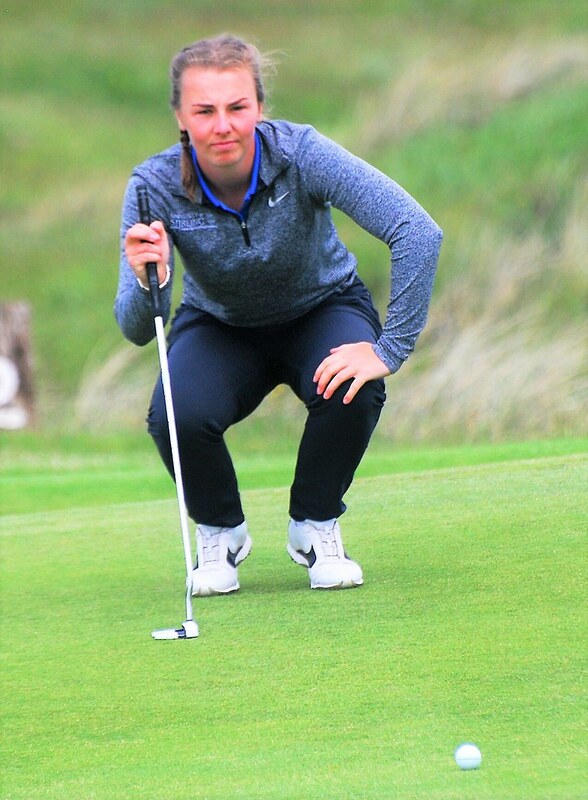 When she shot an equal best front nine of 37 those predictions seemed to have been spot on, with Lieve van Veggel (St Andrews) and Marie Danielsson (St Andrews) failing to make any headway and dropping one shot to Saxton. However, at the turn van Veggel came to life with a great level par back nine putting some pressure onto Saxton as bogeys on 10 and 11 threatened to open up the race. A birdie at 15 offset van Veggel’s birdie on the previous hole and despite a 6 at the last Saxton was able to secure victory by four strokes. Van Veggel’s effort were enough to secure her a solid runner up spot, while Alexa Hammer (St Andrews) won the best of the rest competition to finish 3rd. With Hammer, van Veggel and Danielsson in their line-up, St Andrews I had more than enough for the other teams, defeating Stirling I by nine shots. 215 Matthew Myers (St Andrews) 74 72 69. 230 George Burns (St Andrews) 77 77 76, Peter Kerr (St Andrews) 76 80 74. 228 Jennifer Saxton (Stirling) 77 72 79. 250 Katie Malcolm (Stirling) 87 82 81, Fern Clark (St Andrews) 82 87 81, Kirsten Brown (St Andrews) 81 91 78.